In today’s society, how to keep trim and maintain discipline has become essential regardless of age, gender and job. Thus, a growing number of people have been imposing self-discipline on themselves to maintain their best state of mind and body, consistently exercising for their health and well-being. Yoga and Pilates are among workout regimens pursued by these people. Numerous celebrities have released yoga DVDs with their high level of expertise and know-how. Moreover, what’s noticeable is that the number of men engaging in yoga and Pilates has soared over the years. Inside a yoga studio in Sinsa-dong in southern Seoul, women and men pick up a mat and sit down getting ready for an hour-and-20-minutes class. The weather is sunny and soft music plays in the background, calming tensions and relaxing the body. They have one thing in common _ a slim, toned and supple body, which gives an idea of the effects yoga has upon practitioners. Originating in ancient India about 5,000 years ago, yoga is a Hindu discipline that uses meditation to attain spiritual insight and tranquility. The eastern practice incorporates proper breathing, posture and movement. Depending on methodology and philosophy, yoga is broken down into a number of different types_ including Mantra yoga, Karma yoga, Jnana yoga and Hatha yoga. Hot yoga, categorized as a form of Hatha yoga, is performed under hot and humid conditions and used to be hugely popular in Korea. But it has been on a downward trend. “An increasing number of people are fed up with hot yoga since it heavily focuses on physical exercise and not so much on meditation,” the expert said. Derived from Hatha yoga, Vinyasa yoga differs from its predecessor in that it is faster paced and more emphasis is on breathing and the transition in and out of asana. Generally speaking, yoga itself helps people lose weight and shape their body, but most importantly, it releases the stress coming from modern life, improves the ability to have an insight into mind and purifies the spirit. “Yoga is about finding happiness within yourself,” she said. 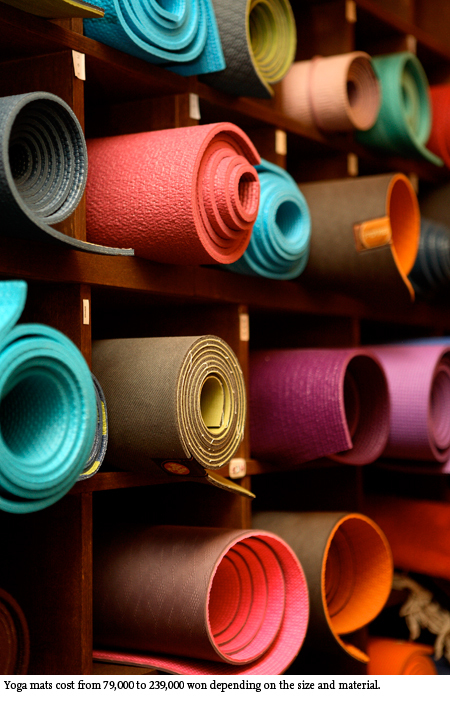 Given those health benefits, more men are knocking on the door of yoga classes. “It is part of my life now,” said a 38-year-old man living in Ilsan in Gyeonggi province, who wished to remain anonymous. He said he has taken yoga classes for about 2 months to discipline himself, and now his body immediately feels lacking something when he misses even one class. “I have become sensitive and positive-minded since I started,” he added. 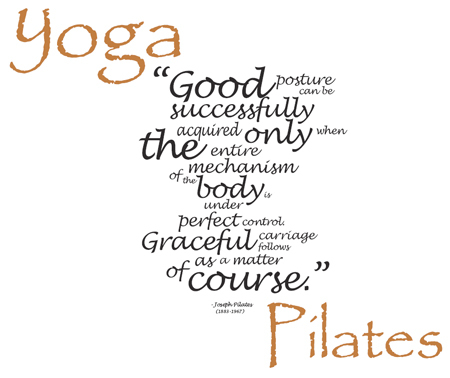 Pilates is a form of exercise developed by German Joseph H. Pilates in the early 1990s. The system was initially designed for prisoners’ fitness and invented when he worked in a prison in the United Kingdom during the World War I. “Pilates focuses on stretching and strengthening the body by contracting and relaxing different muscle groups,” said Jun Hong-jo, professor at Sunshin Women’s University, who runs “Art Pilates” in Cheongdam-dong in southern Seoul on Tuesday. “It eventually improves flexibility, posture, muscle strength and balance,” Jun added. It’s true that quite a large number of people are still confused about the difference between yoga and Pilates. The former is held in a tranquil atmosphere with no mirrors in the room, which can be a distraction for practitioners from focusing on meditating. The latter is vibrant and requires people to check themselves out in the mirror when they carry out repetitive movements. “While yoga has a more spiritual side and emphasizes uniting body and mind, Pilates focuses more on movements to target specific parts of the body.” the professor said. With these differences in mind, the exercise system has grown popular, captivating the souls of fitness fanatics all over the globe, proven by the proliferation of instructor licence programs and associations _ including the Korea Pilates Instructor Association and Korea Pilates Association. Gyrotonic incorporates movement principles from yoga, gymnastics, swimming and t’ai chi and uses a wooden machine with rotational discs and weighted pulleys that allow the exerciser to strengthen their muscles using flowing, circular movements. The professor said that a lot people say they learn how to work on their inner muscles that were never used before. "It’s about knowing your body,” she added. Jai Yoga is located near Apgujeong station on underground line 3. For more information, visit www.jaiyoga.co.kr or call (02) 3443-9642/9667. Jai Yoga Bundang branch is located near Jeongja station on Bundang underground line. For more information, visit www.jaiyoga.co.kr or call (031) 713-9642. Art Pilates is located near Apgujeong station on underground line 3. For more information, visit www.artpilates.com or call (02) 511-1127-8.